Is this call for change is true, I say what a refresher and glimmer of hope- this is truly a gem!!! Finally a man among spineless Eritreans – not all Eritreans that is but those who are/where in position who could have spoken 20 years ago but ignored the destruction of Eritrea. This is also to those so called who have flew Eritrea and all they do is waste their time every coffee shop killing time. Dr Aby opened a Pandora’s box I should say or is it Eritrean leaders thought they were going to take a short cut, easy way out…..No, not so fast. Time will catch up to anyone who played with any nation. Well, finally a man stands high and putting his life on line. 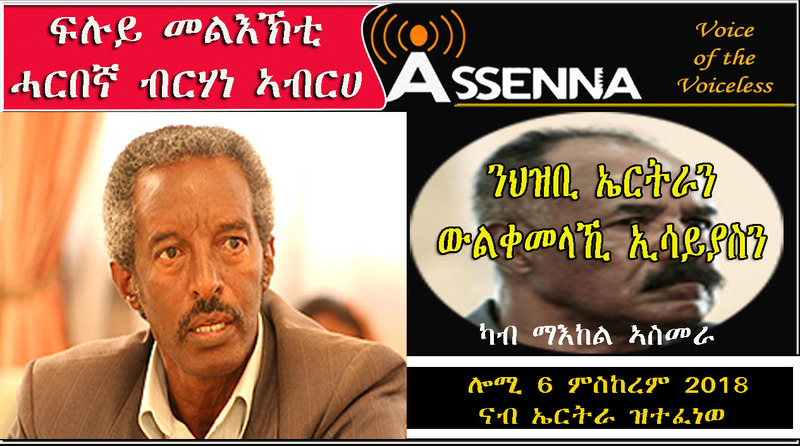 What a courageous man Mr. Berhane is – even though this call is coming a bit late I assure you, if this is true, Mr Berhane has to have come to self-actualization that enough is enough. Just beautiful. G-15,Bitwede’s speech,late Wedi Vaccarro,Wedi Ali and the Forto mutiny,the late Haj Musa and his school children who spilled into the streets of the capital >>>>>>>>>>what makes this one different?is it the timing or who is saying it? folks,if our goal is to shake the foundation of the nation and turn it upside down for the better with the broader solidarity of the people,we should be channeling our energy somewhere else.There are a large segment of the Eritrean people who have never been involved in the tyrants enterprise who are fighting along with you to get rid of the lawless authoritarian regime.